As natural as it may seem for many of us now, digital gaming is still, in fact, a small corner of the industry, meaning it ultimately gets far less exposure, both before and after releases go live. But don’t let a lack of coverage or name recognition deter you; we’ll say it right up front: Ultratron deserves, nay, demands your attention. 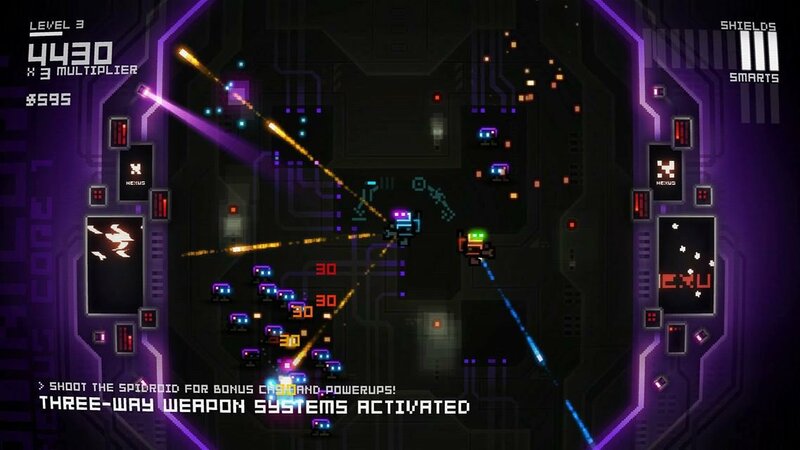 Ultratron arrived on the Wii U eShop last week with little fanfare or pre-release awareness, coming as a surprise to many Nintendo gamers. This is all too common of download-only releases and is an unfortunate and inescapable fact in the current gaming climate, which is likely to lead many to miss out. And failing to play Ultratron is missing out, mind you. The co-op play adds another dimension to the game, making it more accessible than the average shooter—and more rewarding—but no less hectic. The game won’t give you much of a story to back up its action, but it doesn’t need to. Humanity has been all but decimated and you control the last faithful robot, the titular Ultratron (not to be confused with the menacing bot from the newest Avengers movie, as Ultron and Ultratron share rather opposite motivations), to annihilate the A.I. threat with your superior wits and firepower. If you’ve played an arena-based twin-stick shooter before, you’ll feel instantly at home. The controls are as simple and intuitive as moving the left stick to move, tilting the right stick to aim, and hitting one of the trigger buttons to fire a limited-use screen clearing explosion. While genre fans will notice Ultratron draws particular inspiration from the William’s arcade classic Robotron 2084, elements of other well-known classics like Smash TV’s powerups and Geometry Wars’s neon effects combine to make an experience that feels fresh in a genre more than 30 years old. While the game has only four levels in the traditional sense, each with ten waves of enemies, the length of Ultratron is hard to quantify. A skilled player could complete the game in a single (albeit semi-lengthy) sitting after familiarizing himself with enemy patterns and practices, while those less adept in the shooting genre will spend days slowly improving their scores and getting closer to the final boss with each successive attempt. Ultratron does feature off-TV play and, most importantly, a co-op mode, which brings a great feeling of teamwork to each wave survived, while also slightly easing the difficulty for those who need it. This is the only additional mode in the game, however, in true arcade fashion, nothing else is truly needed. Upon starting the game, you'll face your first wave of baddies and be slowly introduced to more enemy types as the game progresses. 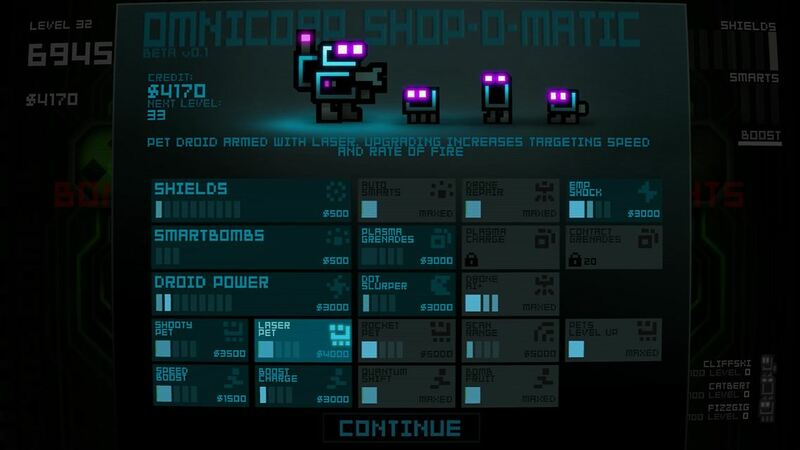 Each wave of enemies is followed by a trip to the in-game shop to purchase upgrades in 20 different categories. These can range from simply refilling Ultratron’s health to friendly robots that can add firepower from new angles. After ten waves, each level is punctuated with a boss fight against a much larger enemy robot with multiple parts and pieces that must be blasted off individually. Checkpoints are activated at the end of every level, which enables the game to be safely played in shorter bursts without fear of losing all your progress because you can’t be late for that meeting. Ultimately, however, Ultratron is an arcade game, designed to be played and replayed infinitely in search of higher and higher scores, and trying for perfect runs. This is, therefore, not a game to be beaten, per se, so the amount of enjoyment a player derives from Ultratron is entirely dependent on her appreciation for the genre. A wide variety of purchaseable upgrades not only keep the action fresh and varied, but also act as incentives to do better each time you play. While the simple-but-perfect controls and overall game design lay the groundwork for a great product, the presentation and gameplay are ultimately what build such a memorable house on that foundation. Ultratron is set in an eerie high-tech world overrun by mindless, destructive robots and everything in the game sells this atmosphere. The enemies appear seemingly at random around the edges of the screen, (giving an ominous sense of an ever-present threat on all sides), before moving in predictable patterns toward your lone bot (cementing the idea that these are simple robots following simple protocols). Most of the enemies appear in hordes (taken out easily by individual shots, but lending weight to the idea that the enemy numbers are overwhelming), while a few special types appear on their own, but either move very quickly or take numerous shots to put down, keeping you from growing too comfortable with your pattern recognition skills. Defeated enemies also drop dots, which are collected by moving near them, and which can be used at the end of each wave to purchase upgrades for your bot. As the extra defense and firepower these upgrades afford become necessary for all but the most skilled players to advance in the game, you are forced to be constantly on the move, dancing about the arena and balancing your shooting and dodging abilities simultaneously. These elements all come together to not only sell the idea that you are a lone warrior robot acting as the last line of defense against unbeatable odds, but also to provide the player with an immense feeling of reward and accomplishment. Success is always a result of the player’s skill, and failure a result of his missteps, so finally conquering a particularly tricky wave of badguybots is a win for the player himself, rather than a win for Ultratron, and that win is then rewarded with the ability to purchase a shiny new upgrade that will help the player to face the next challenge with a little more confidence. It’s a classic system of challenge and payoff that developer Puppy Games captures flawlessly. Similarly, the presentation also masterfully serves the dual purpose of atmosphere and reward. From the minute the main menu starts up, players will notice the screen periodically shake or blur, as if watching an old TV not quite catching a clean signal. These disruptions occur primarily at the menu and shop screens and never affect gameplay, but it recalls feelings of a cyberpunk world where all is not quite as it should be. Enemies are generally dark, and set against a dark background with the only thing causing them to stand out being the otherworldly glow to their eyes and outline. This aesthetic captures the “bump-in-the-night” factor of fearing what can’t be seen, as countless barely visible drones bear down on your lonely champion. Even the enemy names capture the feeling of enormous threat (the bosses, Leiunitas, Bellum, Lues, and Letum, are given the Latin names of the Four Horsemen of the Apolcalypse). Spotlights shine down on Ultratron from the sides of the screens, illustrating that the player’s presence is not welcome, and walls are adorned with symbols indicating a level’s boss, or a particular secured area of the evil Central Nexus you have infiltrated. Enemies hit will blink and explode and before long, screens will be filled with all manner of shining sparks and colored beams illuminating the dark room, creating a visual spectacle that, again, not only reinforces the theme of destroying robots, but is itself a treat for doing well. The multicolored mayhem that results as players successfully navigate the opposing force and decimate its advances gives another reason to continue pushing forward. The music and sound effects stay largely to the background, but also become noticeably more interesting as the battles progress into full-blown firework shows and while it’s nothing you’ll be humming when the game is off, the aural presentation absolutely does its job. And we would be remiss not to mention there’s something strangely adorable about Ultratron’s simple toy robot design and friendly blue glow. Enemies can eventually become rather difficult to spot when they, Ultratron, and a plethora of bullets are all in motion. They are actually visible, but it makes for gameplay that can feel cheap for those whose minute observational skills aren't quite up to the task. Unfortunately, all this is not to say the game is without its flaws, though the impact is ultimately minimal. Boss fights in the game do give a change of pace as Ultratron must dodge more bullets than usual, rather than moving primarily to collect dots, but the bosses themselves aren’t particularly memorable. They are large robots with various parts and weapons that need destroying one by one, but they require no new strategies and don’t bring any unique gimmicks to the table, other than simply being able to withstand a beating. These battles are in no way bad, but we did wish for a little more. Additionally, those skilled enough to make it through the game’s later levels will notice that enemies become progressively darker, with some being very hard to see by game’s end, only lit by a single eye or a faint trail following their movements. This does further the ominous motif we mentioned above, but also ramps up the difficulty in unexpected ways. Players are forced to perfect not only their shooting and dodging, but also their observational skills, spotting and blasting enemy locations by clues, rather than by sight. This can certainly be overcome, and with the right attitude, can be seen as an extension of the game’s challenge, but most players will feel cheated more than challenged by an unseen enemy bombing their derriere. These issues are both easy to overlook, however, and only dampen the otherwise remarkably rewarding experience if you choose to see them as issues at all. Ultratron is a lovingly crafted twin-stick arcade shooter that manages to stand tall on its own two metal legs while drawing inspiration from some of the genre’s most beloved classics. The game is a gem on Steam, Playstation and Xbox stores littered with rival shooters, but stands out even more on the eShop where the genre has been poorly represented. The game’s few flaws can be all but disregarded if seen in the right light, and its high points make for an experience that is deeply satisfying and bound to keep players coming back months after Letum has fallen. Anyone with even a passing interest with the genre should give Ultratron a shot. Those with an interest and a Wii U have even more reason. Thanks for publishing yet another amazing review. Awesome job! Thanks for the kind words. I've really enjoyed this one and probably wouldn't have picked it up right away if I hadn't been reviewing it, so it's a big win for me! Nice review, the second i seen the video of this in the eshop i knew it was for me. The week one sale and that video convinced me to take the plunge even before i seen one review. Not too many games compelle me to buy it knowing nothing about it till that day but there was just something about it that drew me in. Simple yet strategic at the same time. Great Scott! What a review man! I'm gonna download this as soon as my mother gives me another eshop card! DBZmania wrote: Great Scott! What a review man! Thanks! Hope you found it helpful. This game was a sweet surprise, but I should have another review up soon that I'm even more excited about! Kushina wrote: Beautiful review @Khaleesi! Oh no...you shouldn't have said that taboo in front of @bro2dragons! Very nice review @bro2dragons! Is this as good as Scram Kitty in your opinion? @TikiFireEmblem wrote: Very nice review @bro2dragons! Is this as good as Scram Kitty in your opinion? Thanks! To be honest, that's a touch comparison. Ultratron is free-moving which alone makes a big difference in the way it plays. It's much more hectic in terms of the amount of on-screen action than in what you find Scram Kitty, but you can deal with the craziness because it's also much simpler. In Scram Kitty, you're mental focus is split between shooting your enemies and figuring out how to move to get where you want to go. In Ultratron, the movement is natural, so the shooting becomes key. In my opinion, it's at least as good, but they are very different games and there's more than enough room for both in any library. As for @Kushina ... Our Mother's name is not to be taken so lightly. The perpetrator shall be dealt with... appropriately. Your mother has my utmost respect and I shall not say her name. Great review. I'm definitely considering downloading this game after reading your review @bro2dragons! Ultratron is awesome and so is your review! This game is pure awesomeness! Tingle is nowhere to be found 3/10 . Might be worth looking into, excellent review by the way. Wow! This review is really popular! Congratulations @bro2dragons! Thanks again for all the encouragement, guys! Those of you on the fence with this game, I would say buying it should depend on your general enjoyment of the genre. If you're a fan of tough shooters, this is a great one you should have in your collection. If you don't like hard games and don't have a friend to help you out in co-op mode with it, you probably won't get the same enjoyment out of it that I did. This is one of the best arcade shooters available for the Wii U! @bro2dragons excellent review.